Our newest journey of journeys began last Thursday with a bit of a rough start: excessive amounts of time in buses, packing and unpacking bags, exorbitant prices for motorbike flat tires, all led to exhaustion and a bit of crankiness. But it all led up to some of the most beautiful beaches in the world, lots of shore-line yoga, and playing in the clear ocean waters. We packed our far too numerous and weighty bags and hopped into a little propeller plane from Sukhothai to Bangkok. We arrived at the infamous Khao San Road in Bangkok around 8 to meet Amiel. To say that Khao San Road wasn’t our ‘scene’ is an understatement… crowded and bustling with drunk foreigners, taxi and tuk-tuk drivers shouting amongst ramshackle shops piled so haphazardly that a street of normal size lended a walking space of a mere 4 people across, most of whom were stopping to look at the kitschy knick knacks… It was an overwhelming end to our long day of packing, goodbyes, and travel but we slept hard in preparation for 2 more long travel days. 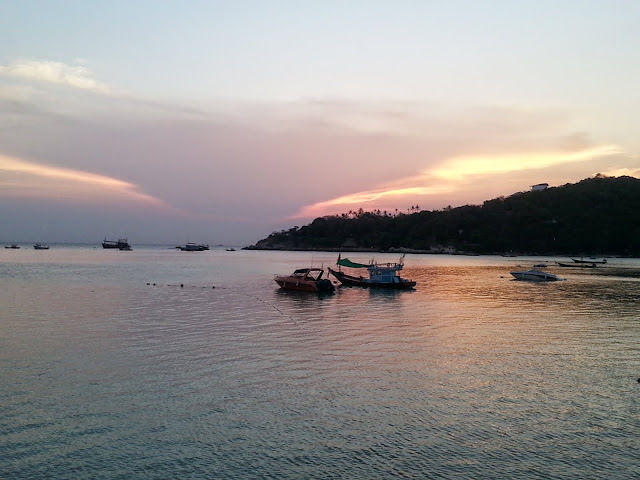 After an 8 hour visa run to Myanmar and 9 hours to Koh Tao, we emphatically arrived!! 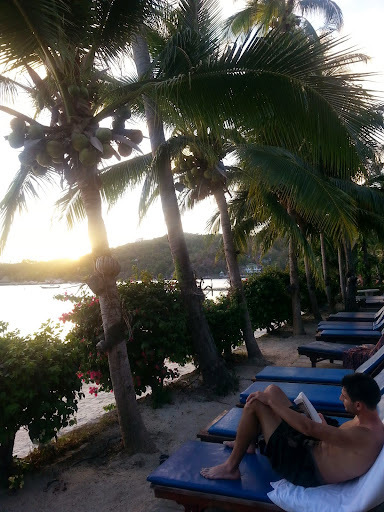 Soaking up the sun, lounging, reading, swimming… Truly paradise. Koh Tao is an island of scuba divers who spend their days swiftly gliding underwater, leaving the beaches fairly empty for us 🙂 One of my personal favorite aspects of this island’s culture is the great caution and concern over environmental issues, preserving their eco-tourism industry as well as the passionate hobbies of the resident dive instructors and enthusiasts. Unfortunately, we didn’t go diving. PT would need to get his certification (about $300) and for me to do a fun dive costs about $30, which is more than our hostel. I think we will wait until Bali and Israel to dive there. 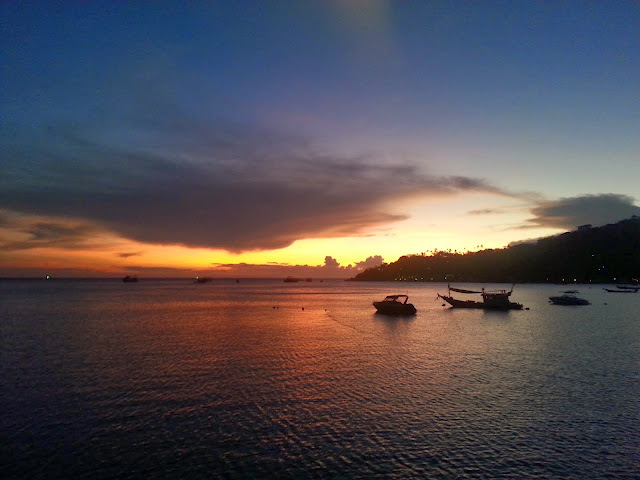 After several lovely days on Koh Tao we excitedly purchased our tickets for a 5 am taxi-ferry-bus-minivan all the way to Koh Lanta, on the other side of the trunk of Thailand in the Andaman Sea. Bearing witness to a vibrant sunrise on the morning ferry ride it felt good to be on the move again. And we’ve fallen in love. 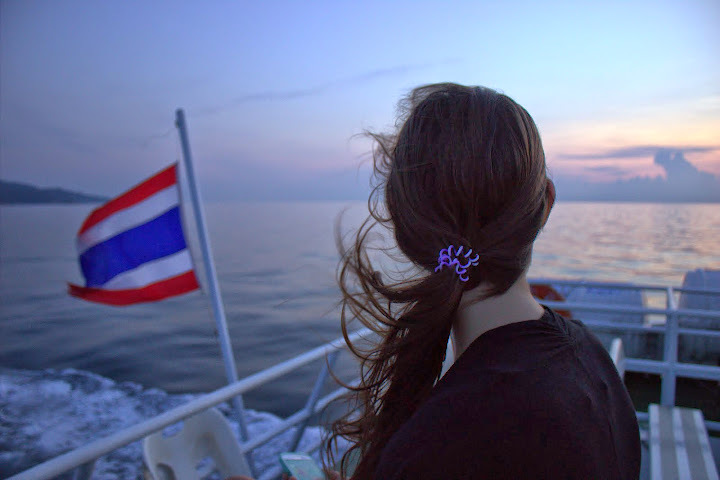 While Koh Tao is beautiful and picturesque, Koh Lanta was meant for us. 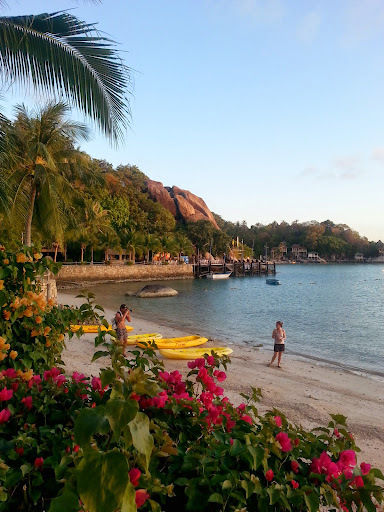 It has a family atmosphere as well as many other young couples (honeymooners) which attributes to the relaxing atmosphere countering the loud dance music and bar crawls of Koh Tao. 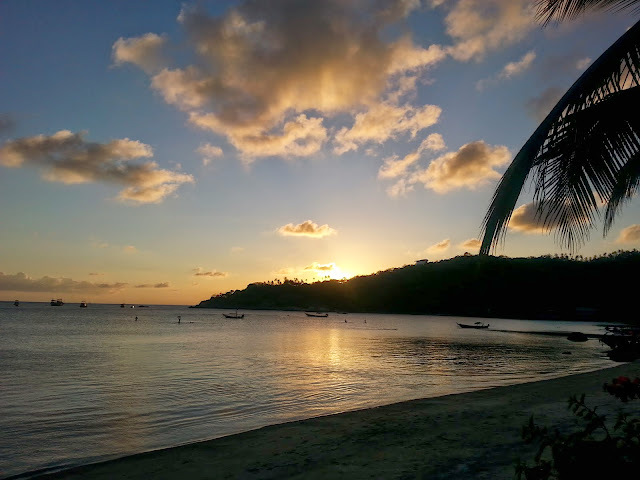 Also, the island hints at the feeling of home: pine trees line the beaches, little hermit crabs burrow and crawl around, and the water is just a little cooler and darker, a nice relief from the hot hot sun. Making the point to spend much time on the “sun mattresses” and lounge chairs provided by our swanky resort, where the servers bring you beers in coozies as you continue to work on your tan, we are truly getting the most out of our resort experience. Ahhh it’s the life. 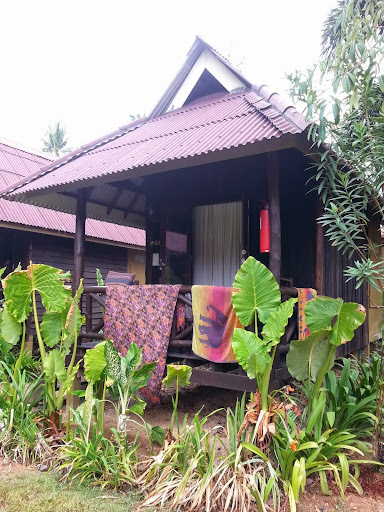 We will be here for about a week before we move on to touristy and well-known Krabi Beach. In an effort to save money, we purchase bananas, papayas, loaves of bread, and peanut butter to satiate our appetite until dinner. Making our way to the local grocery store (12km round trip!) we passed a fruit stall squeezed between the road and mountainous jungle. As we approached, we noticed a large gray monkey loping forward. Suddenly, with daring panache, the monkey sprang forward, seizing two ripe mangoes. The stalls proprietor, clutching a slingshot and bellowing curses, gave chase. Demonstrating a quiet élan, the gray monkey swung himself up the framework onto the tin roof. A few deliberate hops later and he melted into the thick foliage. Glaring at the jungle, the mangoes’ rightful owner stormed back to his stall, impotent slingshot hanging at his side, where he was left to ponder the callus lack of a backwards glance.